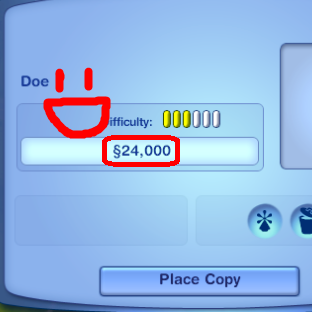 What This Mod Does: Gives your family more money when you make them in CAS. Only choose ONE file. 20k: Gives single member families $20,000 and $2,000 more per family member. 25k: Gives single member families $25,000 and $2,500 more per family member. 30k: Gives single member families $30,000 and $3,000 more per family member. 40k: Gives single member families $40,000 and $4,000 more per family member. What This Mod Does NOT Do: Give you a red smiley face next to your money, cure AIDS, and bring world peace. What Type Of Mod: A really simple XML edit. Like, crazy simple. What It Overrides: It overrides the default amount of money your Sims start with. Known Issues: None. Please drop me a comment if you come across a bug, though! 6/21/2010 - Fixed the 25k flavor. Used to just give 2,500. X) Also added a 40k flavor and cleaned up the page to make it easier to follow. Me, myself, and I (and S3PE).